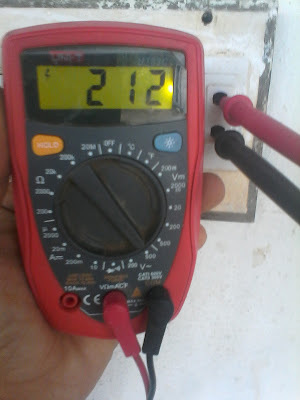 Testing voltage is very important and in this article you will learn that how to test voltage Or how to test ac voltage of your incoming electrical supply. Testing voltage is important because if your incoming voltage is low or high then it's make your electric appliances burn. 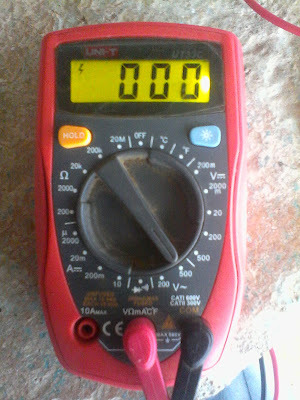 In this post for testing voltage we use digital multimeter as voltage tester. For alternative current potential difference measurement we can use digital multi meter by following method. Mostly in our digital multimeter we have option for testing ac voltage which are like 200V and 500V. For 110 volts testing we use 200 volts option and for 200 to 500 volts testing we use the 500 volts option. For testing AC voltage first of all select the AC voltage testing option by using selector switch as shown in below image. After plug in the multimeter probes in an electrical outlet / socket or connect the probes to the Electric supply as shown in below image. In above image, the multimeter shown the voltage 212 volts, it's means that the incoming supply voltage is 212 volts. Now if you have any question regarding testing voltage then you can ask me in below comment section. This was helpful in learning! I husband want to Buy Digital Clamp Meter and I was collecting information on its use and more. Thanks for sharing. Keep exploring. Hello Sikandar. Good tutorial. If someone need to test voltage then this will be a perfect guide to read. I will bookmark your site as a reference. However, I have a multimeter blog as well. http://bestmultimeterreviews.org It will great if you add my website in your article as a reference.